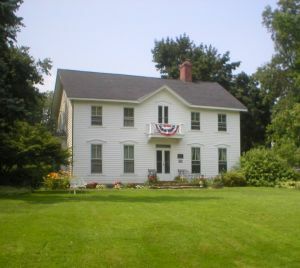 The Grand Island Historical Society restored and maintains the farm house known as River Lea and located in Beaver Island State Park. It was built on Lewis F. Allen's property, Allenton Farms, by his son, W. Cleveland Allen. Today it is owned by New York State. Top: Luncheon Guests. Middle: Historical Society docents. Bottom: Denise Reichard as Clara Barton. Mary Stewart photos. 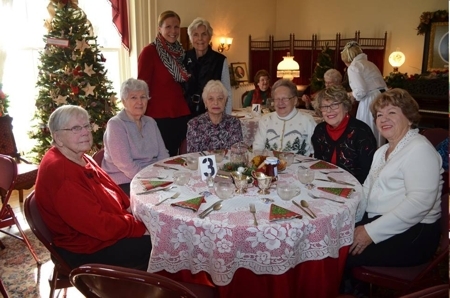 The Grand Island Historical Society annual Holiday Luncheons took place this week. This year's theme was "Christmas in the Country". River Lea was decorated to the nines and had a wonderful gift shop with ornaments, wreaths, decor, handmade soaps and canned goods available for purchase. The program featured Denise Reichard portraying Clara Barton and was enjoyed by all. 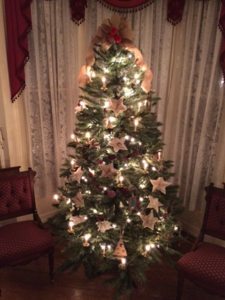 The Grand Island Historical Society will host a Christmas Open House at River Lea in Beaver Island State Park on Sunday, December 6th from 1:00 - 4:00 p.m. River Lea will have a guest harpist and be decorated in a country style. Society members will be on hand to answer questions and offer information. Refreshments will be served. 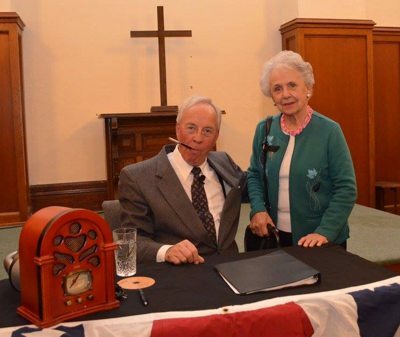 The GI Historical Society recently hosted "An Evening with FDR" at Historic Trinity, featuring Lockport resident Albert McFadyn as President Roosevelt. The standing room only crowd enjoyed a step back in time while listening to stories, political speeches and songs from the 30's and 40's. The President read a letter from a young girl and said "it was sent to me by Shirley Luther of Grand Island, NY", which brought a chuckle from the crowd. The audience also enjoyed singing along with the old time tunes. The Grand Island Historical Society will host an Open House at River Lea in Beaver Island State Park on Sunday, November 8th from 2:00 - 4:00 p.m. Society members will be on hand to answer questions and offer information. Refreshments will be served. 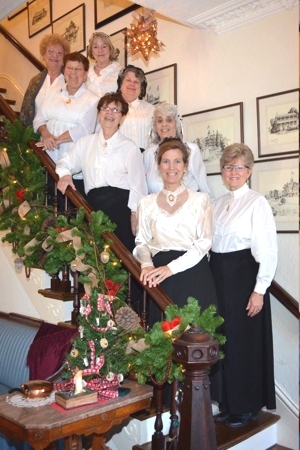 Members of the Grand Island Historical Society will host their annual holiday luncheons themed "Christmas in the Country" at noon on Monday, November 30; Tuesday, December 1; and Friday, December 4. Reservations may be made after October 6 by calling Sue at 773-5313. Cost of the luncheon is $25.00. The Society's Country Store featuring handmade gifts will be open prior to the lunch. The Society's headquarters at River Lea in Beaver Island State Park, will be decorated and ready for the Christmas season. 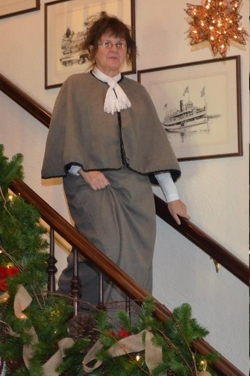 This year's program features guest speaker Denise Reichard portraying Clara Barton. Albert McFadyen portrays Franklin Delano Roosevelt. On Thursday, November 5, 2015, at 7:30 p.m., the Grand Island Historical Society will have a special program featuring a distinguished and famous guest, Franklin Delano Roosevelt, as portrayed by actor Albert McFadyen. His portrayal includes stories, tales of adventure, and perhaps some songs! The meeting and presentation will be at Historic Trinity Church at 2100 Whitehaven Rd., Grand Island, N.Y 14072. The public is encouraged to attend. See Flyer. Mr. McFadyen, 69, is a Lockport resident and an actor/singer who has performed in numerous roles, at various productions, at many local venues such as the Lancaster Opera House, The Catherine Cornell Theatre at UB, the Ghostlight Theater, the Riviera Theatre, the Palace Theatre and the State Theatre in Sandusky, Ohio. He has been Father Seamus McMurphy for over 11 years in the long running hit Irish funeral/wake dinner theater production of Finnegan's Farewell. In the late 1990's he portrayed FDR in the musical Annie at both the Lancaster Opera House and at Villa Maria College and his performances were well received. The rest as they say, is history. His role as FDR has evolved into his own one person production, "An Evening With FDR" which brings American History to life in both word and song. 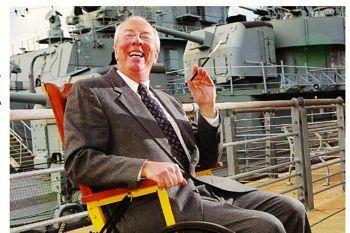 In 2006 his Roosevelt program was performed to a standing room only audience at the Franklin D. Roosevelt Library and Museum in Hyde Park, New York. Over the years Mr. McFadyen has been honored to work with four of the munchkins from MGM's The Wizard Of Oz, with Batina Grey, one of Grace Kelly's bridesmaids and John Raitt, the father of Bonnie Raitt and a Broadway star in the 1940s - 1950's. Mr. McFadyen is the voice of FDR in Ken Burns PBS documentary Our National Parks: America's Best Idea and he is a credited performer in Mr. Burns' latest PBS documentary "The Roosevelts: Franklin, Eleanor and Teddy". He hopes to portray Mr. Roosevelt for many years to come and to help us to take a stroll down America's Memory Lane during the momentous years of the Great Depression and World War II. He can be contacted through his website franklindrooseveltlive.com. Mr. McFadye is very proud of his Depression Era 1936 Plymouth Deluxe Touring Sedan which he takes to many local car cruises during the summer season. Let us always remember the 7th of December! The Grand Island Historical Society will host an Open House at River Lea in Beaver Island State Park on Sunday, October 18th from 2:00 - 4:00 p.m. Society members will be on hand to answer questions and offer information. Refreshments will be served. The Historical Society meeting is at River Lea, Beaver Island State Park on Thursday, October 1st at 7:30 p.m. Featured speaker is Bill Kae, on Crystal Beach and Crystal Beach Steamers. The Grand Island Historical Society will host an Open House at River Lea in Beaver Island State Park on Sunday, September 20th from 2:00 - 4:00 p.m. Society members will be on hand to answer questions and offer information. Refreshments will be served. The Grand Island Historical Society's September meeting at River Lea in Beaver Island State Park is a potluck at 6:30 p.m., Thursday, September 3rd. (Please bring a dish to pass and your own place setting.). This will be followed by speaker Carol Rogers, a State Park Naturalist from the New York State Office of Parks, Recreation and Historic Preservation. Carol's program at 7:30 p.m. is entitled "The Great Gorge Route", recalling the scenic railroad ride along the Niagara Gorge from 1895-1935. 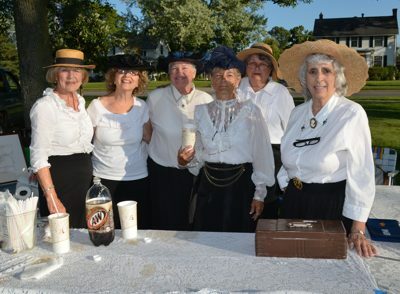 Members of the Grand Island Historical Society hosted their annual root beer float fundraiser during the town sponsored band concert in Marion Klingel Town Commons on July 21st. Members of the Grand Island Historical Society will host their annual root beer float fundraiser during the town sponsored band concert in Marion Klingel Town Commons at 7:00 p.m., Tuesday, July 21st. The concert will feature the Lyle Stang - One Man Rockin' Band. Rain date is Thursday, July 23rd. Town sponsored Tuesday concerts continue through August 4th. 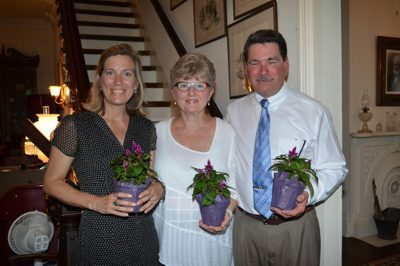 The Grand Island Historical Society had their installation of officers and catered dinner on Thursday, June 4th at River Lea. The guest speaker was Larkin Soap Company expert Jerry Puma with a presentation on the history of the Larkin Company and a display of artifacts. The Grand Island Historical Society will have their installation of officers and a catered dinner on Thursday, June 4th at 6:30 p.m. The guest speaker will be Jerry Puma with a presentation on the history of the Larkin Company, including a display of artifacts. Call Carolyn Doebert for dinner reservations, 773-2463. 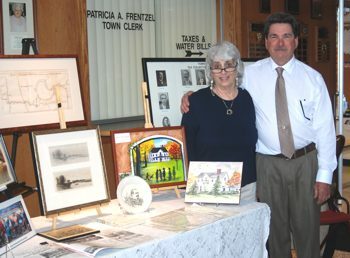 Historical Society member Jeri Benzing and President Kurt Nestark. Historical Society and Preservation Advisory Board members Carolyn Doebert, Sharon Nichols and Shirley Luther. 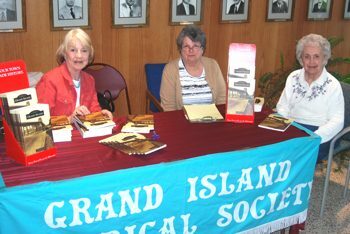 The Historic Preservation Advisory Board and the Grand Island Historical Society teamed up to create a "History of Grand Island" book that was presented at Town Hall on Tuesday, May 5th. 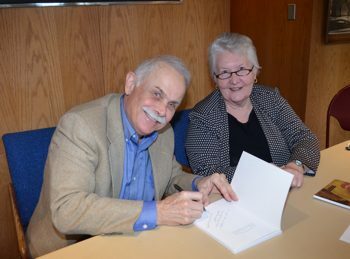 Authors June Justice Crawford and Dr. Gerald Carpenter were on hand to sign copies of the hundreds of books sold. The Historical Society had a display of Island treasures and a power point presentation of some of the book highlights was shown. If you would like to purchase a book, they are $21.99 and are available at DeSignet Jewelry, 1869 Whitehaven Rd. and at River Lea, the home of the GI Historical Society, during meetings and open houses. The next meeting is Thursday, May 7th and Open House is Sunday, May 17th. The Historical Society May general meeting and program is on Thursday, May 7th at 7:30 p.m. The program will feature Wilson, NY Town Historian Francis Gallagher who will present a power point presentation on Cobblestone Houses. The meeting is open to the public and refreshments will be served. 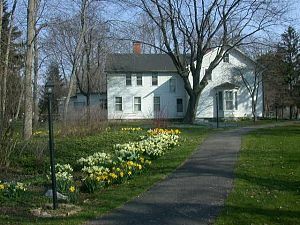 The Grand Island Historical Society will host an Open House at River Lea in Beaver Island State Park on Sunday, April 19th from 2:00 - 4:00 p.m. Society members will be on hand to answer questions and offer information. Refreshments will be served. The Historical Society April general meeting and program is on Thursday, April 2nd at 7:30 p.m. Members June Crawford and Wendy Duignan will share a power point presentation updating the progress of the restoration of Graycliff. The first Historical Society general meeting and program of 2015 is on Thursday, March 5th at 7:30 p.m. The speaker is member, Bill Koch, with a power point presentation on his trip to Russia.